Pain management is a branch of medicine, which employs approach to ease the suffering and improve the quality of life of individuals suffering from pain. Pain can be classified based on its occurrence and duration along with the affected body part. First line of treatment for pain management is pharmaceutical therapeutics or pain killer drugs, most of which are well-known brands. The global pain management drugs market was valued at $58,577 million in 2016, and is estimated to reach $77,131 million by 2023, registering a CAGR of 4% from 2017 to 2023. Rise in geriatric population is the major factor that drives the growth of the global pain management market, as aged people are more prone to suffer from joint pain and other chronic conditions. Moreover, surge in prevalence of chronic diseases such as cancer, diabetic neuropathy, and osteoarthritis propels the market growth. Furthermore, increase in number of surgical procedures and rise in healthcare expenditure are expected to fuel the growth of the market. However, drug exploitation, patent expiration of prescription pain medication drugs, and availability of substitutes such as pain relief devices restrain the market growth. The global pain management drugs market is segmented based on drug class, indication, and geography. On the basis of drug class, the market is categorized into nonsteroidal anti-inflammatory drugs (NSAIDs), anesthetics, anticonvulsants, antimigraine agents, antidepressants, opioids, and nonnarcotic analgesics. Opioids are further classified into tramadol, hydrocodone, oxycodone, and others (fentanyl, morphine, meperidine, codeine, and methadone). By indication, the market is divided into arthritic pain, neuropathic pain, cancer pain, chronic back pain, postoperative pain, migraine, and fibromyalgia. Geographically, it is analyzed across North America, Europe, Asia-Pacific, and LAMEA. This report offers a detailed quantitative analysis of the current & future market trends from 2016 to 2023 to identify the prevailing opportunities. 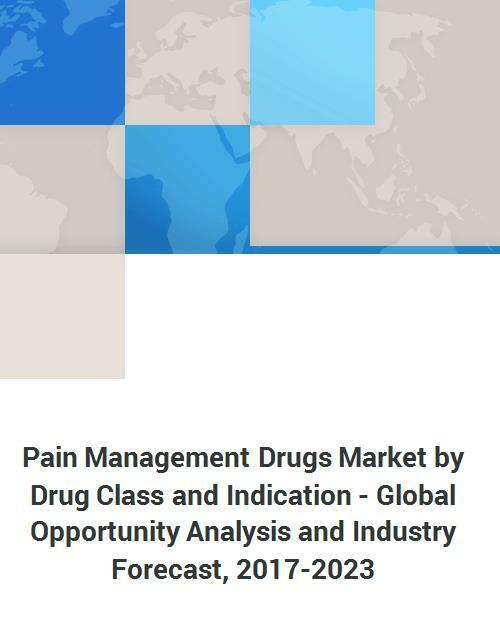 The global pain management drugs market is comprehensively analyzed with respect to drug class, indication, and geography. In-depth analysis based on geography facilitates to analyze the regional trends to assist in strategic business planning. The developmental strategies adopted by key manufacturers are enlisted in the report to understand the competitive scenario of the market. 7.4. Endo Health Solutions, Inc.
7.7. F. Hoffmann La Roche Ltd.
7.8. Merck & Co. Inc.